We live in a perilous world, a dangerous environment. Watch television news or read your daily newspaper and you are subjected to a daily diet of robberies, rapes, riots, murders, fires, earthquakes, floods and famines. Do you find yourself becoming disturbed by what is happening around you? Do you feel helpless, unable to control these events? Do you even sometimes feel afraid? In this section, L. Ron Hubbard dissects this phenomenon of the dangerous environment, providing methods that will not only help you overcome your fears, but allow you to help others. Applied on a broad scale, this information brings about an enormous calming influence and enables people to lead happier lives. 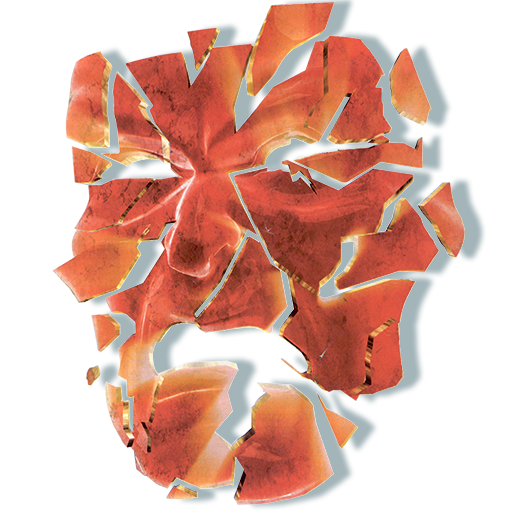 Used on an individual scale – by you – it will enhance the lives of your family, friends and associates. Stress from the Dangerous Environment (n.d.). scientologyhandbook.org. Retrieved 19 May 2010 from http://www.scientologyhandbook.org/SH12.HTM. Volunteer Ministers sell and deliver entry level material on the SP doctrine. You don’t have to live with stress. A truly life-changing discovery has been made. A way to step off the roller coaster and spot the source of chaos in your life has been found. The millions living with stress no longer have to be so ill, so unhappy, so suppressed by a menace they can neither see nor do anything about. 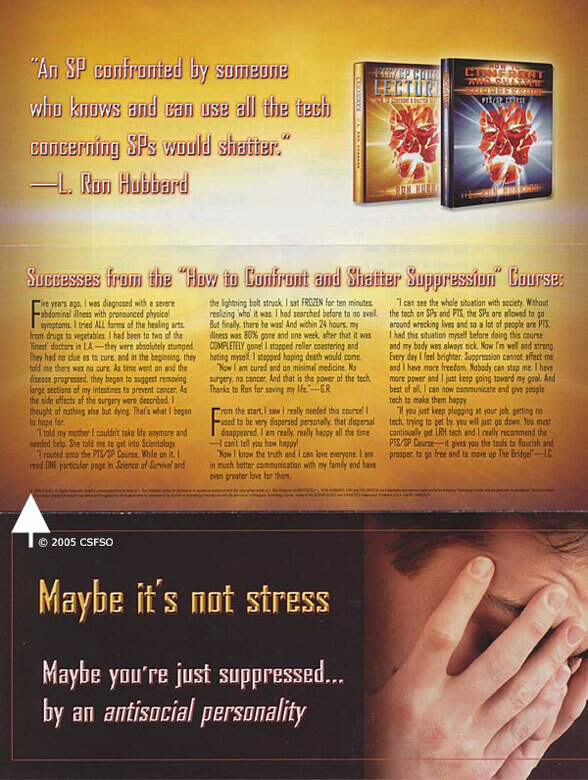 This discovery is in The Cause of Suppression, a booklet by L. Ron Hubbard. With this tool you can quite literally build a new life—even save a life. Help create a real future and live life in the sun again. Buy this booklet and use the life-changing data it contains in your life and the lives of those you love. “My stepmother had been an alcoholic and had been under treatment by psychologists and psychiatrists for years, trying to handle this condition. Their ’handling’ was to give her drugs and tell her what to think and do in life. As a result, her outlook on life had been bleak and very negative. I finally discovered the technology about suppressive persons. I found out who had been suppressing my stepmother and I learned how to help her. Today she doesn’t drink at all, is completely cheerful—we get along great! After all these years, I am extremely proud that we have a happy future.” T.G. “This book gave me a reality adjustment. I thought getting sick and having accidents were just ’a part of life.’ So it was only normal that they always happened to me. After reading The Cause of Suppression booklet, I now know that this is completely false. I don’t have to live this way. There is a reason for my constant illness and mistakes. When I spotted why this was I almost jumped out of my socks. It was incredible. It was also so obvious, but without this booklet I would have never known.” E.K. Five years ago, I was diagnosed with a severe abdominal illness with pronounced physical symptoms. I tried ALL forms of the healing arts, from drugs to vegetables. I had been to two of the ‘finest’ doctors in LA.—they were absolutely stumped. They had no clue as to cure, and in the beginning, they told me there was no cure. As time went on and the disease progressed, they began to suggest removing large sections of my intestines to prevent cancer. As the side effects of the surgery were described, I thought of nothing else but dying. That’s what I began to hope for. “I told my mother I couldn’t take life anymore and needed help. She told me to get into Scientology. “I routed onto the PTS/SP Course. While on it, I read ONE particular page in Science of Survival and the lightning bolt struck. I sat FROZEN for ten minutes, realizing ‘who’ it was. I had searched before to no avail. But finally, there he was! And within 24 hours, my illness was 80% gone and one week, after that it was COMPLETELY gone! I stopped roller coastering and hating myself. I stopped hoping death would come. “Now I am cured and on minimal medicine. No surgery, no cancer. And that is the power of the tech. Thanks to Ron for saving my life.”—G.R. From the start, I saw I really needed this course! I used to be very dispersed personally; that dispersal disappeared. I am really, really happy all the time —I can’t tell you how happy! “Now I know the truth and I can love everyone. I am in much better communication with my family and have even greater love for them. “I can see the whole situation with society. Without the tech on SPs and PTS, the SPs are allowed to go around wrecking lives and so a lot of people are PTS. I had this situation myself before doing this course and my body was always sick. Now I’m well and strong. Every day I feel brighter. Suppression cannot affect me and I have more freedom. Nobody can stop me. I have more power and I just keep going toward my goal. And best of all, I can now communicate and give people tech to make them happy. Maybe it’s not stress… (2005). [Advertisement]. Church of Scientology Flag Service Organization.